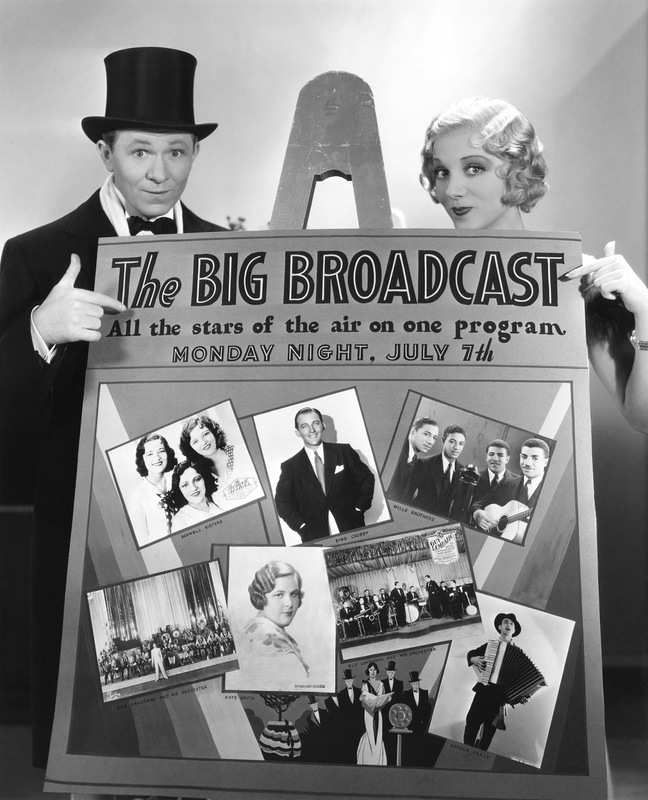 Paramount made the first of its Big Broadcast films, the first and best of them. 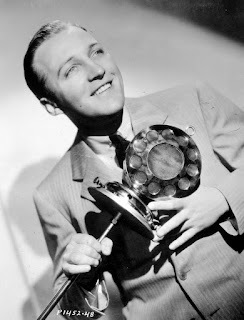 This first one gave Bing Crosby his first role in a feature film, previously he had done guest appearances and also short subjects for Mack Sennett. Not wanting to mislead anyone about who was numero uno in this film, Paramount had him play a radio crooner named Bing Crosby. Eleven years later Frank Sinatra would make his feature film debut as Frank Sinatra. Bing's the star attraction of this one horse town radio station, appearing for Griptight Girdles on the Griptight Girdle Hour. That is when he can get to the studio. His job is being threatened and he's also coming between Stu Erwin who buys the station and Leila Hyams who's manager George Burns's secretary. It's a thin plot, but nicely done and it's to show off some of radio's greatest talents of that year. In addition to Bing Crosby, appearing are Kate Smith, Arthur Tracy, the Boswell Sisters, Burns and Allen, Cab Calloway and Vincent Lopez with their respective orchestras, the Mills Brothers and tenor Donald Novis. Bing gets to sing three numbers, Please and Here Lies Love which were written for this film and Dinah. Crosby made a classic recording of Dinah with the Mills Brothers and I wish they'd reprised that for the movie. Instead it's done with a black shoeshine boy giving him a beat with the rag while Bing is scatting like Ella Fitzgerald. Bing was great, but the staging is something that black people would find offensive. Please became a great early hit for him. Here Lies Love is sung by Crosby, but he reprises it after it's been introduced by Arthur Tracy. Tracy, a Jewish immigrant from Russia, was billed as the Street Singer and had an almost operatic quality to his voice. 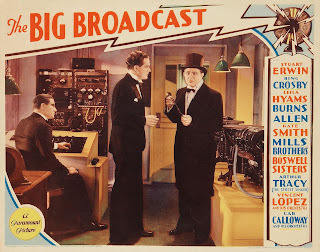 He rivaled Crosby, Russ Columbo, Rudy Vallee, and Morton Downey in popularity as a radio singer, but American movie audiences didn't take to him. He went to Great Britain in the mid-30s and there he became a movie star. He went back to the US after World War II and only appeared sporadically after that. Tracy was fabulously wealthy due to good investments and lived to the age of 97. He did a cameo appearance in Crossing Delancey, you'll see him briefly discussing issues of the day over the pickle barrel there. For Kate Smith, radio was a godsend. That beautiful and powerful voice was also trapped in an elephantine body like a Wagnerian opera soprano. She was never going to be a film star. But she was radio's most popular female vocalist, no one else was ever even close and she sings a great rendition of It Was So Beautiful in The Big Broadcast. Burns and Allen did surreal comedy that was probably only equaled by Monty Python years later. Gracie Allen was in her own world and the ever patient George gave up trying to deal with her reasoning. They did some great guest bits in films like this one and two more with Bing Crosby. But they never really carried a film by themselves with the exception of Here Comes Cookie. I did a review of that and it's the best example of their work. Donald Novis was a popular radio tenor, totally forgotten now. He also was on the Broadway stage and in Rodgers & Hart's Jumbo introduced their classic, The Most Beautiful Girl in the World. They give him Trees to sing, Joyce Kilmer's poem put to music. I wish he'd sung something more popular. With all these radio stars it's hard to remember that the nominal star of the film is Stu Erwin. Erwin did a fabulous job in creating some great milquetoast characters from the early talkies. The climax of the film involves a long running gag with him trying to get a recording of Bing singing Please to the studio to substitute for Crosby who's AWOL. It's done almost without dialog and it is interspersed with several of the stars previously mentioned. It's a hilarious bit of slapstick.